A staggering 1,508 pasties were sold during the store’s first four days, 870 of which were Warrens Bakery’s iconic medium steak pasties, as local Kenilworth residents gain a taste for the premium craft bakery’s award-winning signature bake. The bakery, which is located in Talisman Square, had a hugely successful opening with locals queueing up before the bakery had opened. The store which has created six jobs, welcomed 1,365 customers through its doors during its first few days of trading – including Tim Horne, the store’s first customer. Tim, a native of Truro, now lives in Kenilworth. Established in 1860, Warrens Bakery has a rich heritage and is proud to put a firm focus on provenance, hand crafted skill and innovation. With an array of hand-crafted savoury bakes it’s not only Cornwall’s oldest bakery’s pasties which have proved extremely popular in Kenilworth but their sweet treats too. Over 330 morning goods, including 84 Belgium buns and 525 confectionary items flew out of the new store’s doors in just the first four days. Warrens Bakery’s hard work and dedication over the years has seen them receive a long list of accolades. Most recently they were finalists in the prestigious Craft Business Award in the Baking Industry Awards 2015 and 2017 and they have also won a haul of awards at the 2016 British Pie Awards and World Pasty Championships. The arrival of the new store coincides with the launch of the latest Spring range of new bakes. Locals can be among the first to try the ‘Around the World in 80 Days’ limited-edition range of delicious pasties and sandwiches; all of which are inspired by family meal-time favourites from around the globe. The artisan bakery has launched their first ever ‘Pasty Passport’ which customers can pick up in store. 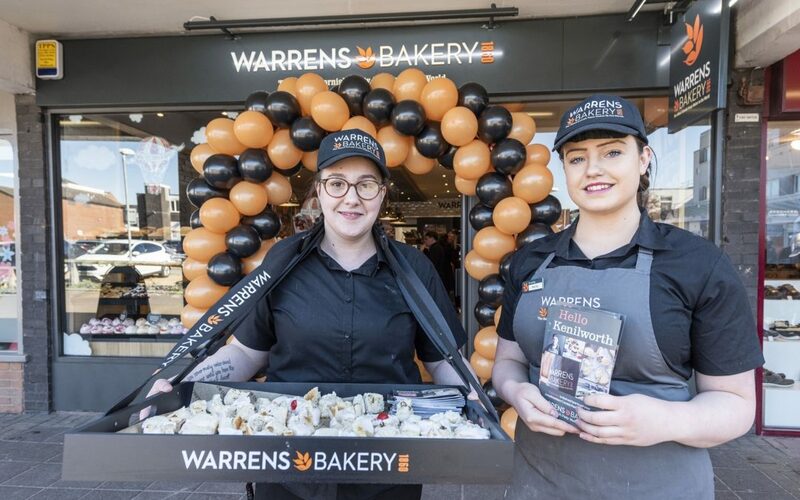 One of the UK’s top three British craft bakeries, Warrens Bakery now have over 60 stores throughout Cornwall, Devon, Somerset, Manchester, Birmingham, Hampshire, Oxfordshire, Essex and London. To hear the latest news from Warrens Bakery follow them on Twitter (@WarrensBakery) or link up with them on Facebook www.facebook.com/warrensbakery. Why not also pop into the new bakery at 14 Talisman Square, Kenilworth.